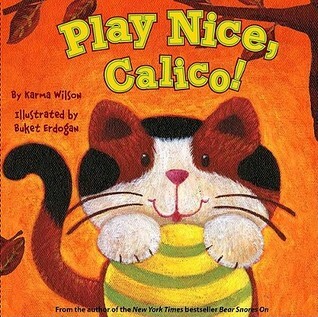 Title : Play Nice, Calico! Karma Wilson Buket Erdogan - Karma Wilson grew up an only child of a single mother in the wilds of North Idaho. Way back then (just past the stone age and somewhat before the era of computers) there was no cable TV and if there had been Karma could not have recieved it. TV reception was limited to 3 channels, of which one came in with some clarity. Karma did the only sensible thing a lonely little girl could do…she read or played outdoors.Playing outdoors was fun, but reading was Karma’s “first love” and, by the age 11, she was devouring about a novel a day. She was even known to try to read while riding her bike down dirt roads, which she does not recommend as it is hazardous to the general well being of the bike, the rider, and more importantly the book. Her reading preferences were fantasy (C.S. Lewis, Terry Brooks, etc…) and historical fiction (L.M. Montgomery, Laura Ingalls Wilder, etc…). Those tastes have not changed much.Karma never considered writing as a profession because her mother was a professional writer which made it seem like mundane work. At the age of 27 she realized that she still loved well-written children’s books of all kinds, from picture books to young adult novels. By that time Karma was a wife and the mother of three young children. Trips to the library with her kids were a combination of emotions…a good book meant fun for all! But so many of the books weren’t what her children wanted to listen to.Then a tax refund changed everything. With the money the family decided to invest in a computer. Karma was forced to learn to type. Combining her desire to make the expensive computer pay for itself, her new-found typing skill, and her love of children’s literature, Karma started writing for children. She wanted to put a few more good books on the library shelves and pay off that computer! Countless rejections and three years later Karma was finally accepted by book agent Steven Malk (who had already rejected her once, which she never lets him forget). Her first book, Bear Snores On, was released in 2002. The computer was paid for!Since then Karma has had more than 30 books accepted for publication. Many of those are on the shelves of libraries and bookstores around the world. Her books have received numerous state and national awards, been translated into dozens of languages, and a few have made an appearance on the New York Times bestseller list. Karma sincerely hopes that her books bring joy to children and families everywhere.Karma writes humorous, rhythmic picture books for the very young, and humorous and wistful poetry for the primary grades. These days Karma lives with her handsome husband Scott, and her three not-so-young-anymore children, two dogs, two chickens and one cat on some modest but lovely acreage in NW Montana. Her hobbies include reading (of course), photography, baking, yoga, and a passion for Mixed Martial Arts.